College can be one of the best or one of the worst places to start a band. On one hand, there can be a wealth of talent available to a fledgling musician from which to draw and begin an adventure, but on the other, college students can be among the busiest of people that have very little time to devote to non-academic pursuits. When the former happens, of course, the results can be quite impressive, and the quartet Overseer (not to be confused with the metal band on Solid State Records) is a noteworthy example. The result of three years of growth, In the Offing shows Overseer at an exciting stage of accomplishment and potential. From the first track, Overseer has clearly sidestepped many "rookie mistakes": the mixing is professionally done, Graham Jones' vocals show appropriate emotional restraint, and really, that's half the battle to a listenable effort. Overseer's genre of choice has been adapted to the band's personality quite effectively; citing influences like Ruth, Gungor, and Switchfoot, the band dons a "rootsy" rock approach that's quite versatile throughout the album's run. Tracks like "Broken Man," "Catastrophe," and "End of Your Love" showcase Overseer's fast-paced and harder edged side, whereas "When God Speaks," "North or South," "Timothy," and the ambitious "Untitled" take more time to make their impact. Acoustic guitars and mandolins mix well here for a bit of a folk influence, but the electricity throughout the album thankfully keeps the album from falling into Mumford & Sons territory. Overseer isn't attempting to replicate anyone, and it's a refreshing sound from start to finish. 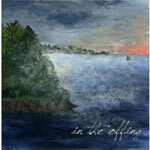 In the Offing proves to be a thoughtfully written album, as well, using a holistic songwriting approach to include themes such as self-reflection and honest worship. "End of Your Love" uses humility to demonstrate brokenness ("I'm amazed that we could be together/You are God and I'm not worth the effort/Somehow You offered Your heart forever and ever/in which case I never find the end of your love") while "Timothy" relies on God's power to move the sinner away from wrongdoing ("Will you find me, will you teach me, will you guide me, Lord?.../Lead me all the way/catch me should I fall to an old calamity/and push me to where you've already gone"). "Untitled" is perhaps the album's highest point, using compelling storytelling to demonstrate the truth that accomplishing God's will trumps everything ("So live your life, don't just breathe it in/'Cause you'll never survive if you only take what you give"). Of course, independent acts always have a few inevitable missteps on the first go-round, and Overseer is little exception. In the Offing has an intriguing organization, as not every track in the sequence fits snugly next to another; for example, the epic closers "Turn My Eyes" and "Valinor" serve as bookends to a comparably less climactic "Northmeadow," resulting in a less smooth ending to the album than could have been desired. Some lines don't sell themselves very well, either, as an adage like "I'm no prophet, I'm no preacher, I'm just barely some kind of college kid" ("North or South") seems to give away more credibility than earn it. These are the sorts of issues, however, that are improved upon with more experience, and Overseer is a band that will surely benefit from it. In the Offing is an above average independent effort that shows plenty of promise for Overseer. The band's next immediate step is developing their sound even more, and more experience as a band will surely deliver that reward. Every independent band has its own edges to sand off, but when Overseer does, they will become a truly distinctive group; for now, Overseer has set themselves up well for a fruitful career with In the Offing. Jesus freak Hideout (Roger Gelwicks): How did Overseer start? Graham: Overseer began originally as three guys (Josh, Jeremy, Graham) who had mutual interest in music and were interested in entering a University-sponsored Battle of the Bands. We picked up a fourth member, our friend Michael, with the primary intention of him filling in the rhythm guitar parts needed for the songs our lead singer, Graham, had written for the contest. After winning the Battle of the Bands, doors began to open up for us, and our original one-time project stuck together. JFH (Roger): Starting the band as college students, how have you made the time to develop as a band? Graham: It certainly hasn't been easy. Juggling studies, projects, relationships, church commitments, and seemingly endless extracurricular activities is hard enough without the work involved in keeping a successful independent band together. But setting aside the extra time to practice, learn new songs, and just spend time together has helped our camaraderie and our musicianship. A great amount of our songwriting and recording progress happened during summer and winter breaks, but the simple stress of having frequent shows has challenged us not only to consistently play at the best of our ability, but to find ways to improve as musicians. It helps that we're also involved in other ensembles/music groups, so we bring a variety of styles and fresh ideas to the table when we play. JFH (Roger): What is it like for a band to start at Oklahoma Baptist University? Graham: Oklahoma Baptist is an incredible university, and there is definitely a lot of encouragement for people to express themselves through music, whether in small coffee shop settings or in larger-scale worship services. However, being an independent musician in a rather small town is definitely a challenge. It's really difficult to handle performing, booking, managing, and accounting for things like merchandise when we're all full-time students with part-time jobs, but we've seen a great deal of support from our colleagues during school and from the faculty at OBU, without whom we couldn't have any success. JFH (Roger): Describe the creative concept of In the Offing. What kinds of artists influence your music? Graham: Especially in the recording process, we strived to accomplish the best sound for each song without necessarily focusing on a cohesive sound. But, our varied influences culminate into a unique style none of us really could have expected. Switchfoot, Ruth, Gungor, NeedToBreathe, and Phil Wickham have influenced our sound pretty heavily, so you'll hear elements of folk, contemporary worship, alternative, and rock that stems from each of them. The idea for the album title was Jeremy's brainchild. As we were scrambling to find a name for the album (several months after we had actually recorded it, by the way), I kept seeing all of these nautical elements in these songs, with lines like "adrift in the ocean, just a man about to drown" and songs like "Valinor" running through my head. Jeremy struck gold when, during a band meeting, he was scrolling through nautical terms on his iPhone. He told us about "in the offing," which is a point along the sea near the horizon. As we thought about our development as a band, we always felt like we were aiming for something, something 'in the offing,' and these songs really give a good portrayal of what the journey has looked like for us so far, as we still pursue that goal which is visible but not yet attained. It's about what He has done for all of us through Christ and what now is coming. In that sense, we believe that He is leading all of us to a place in the offing, towards His shore. JFH (Roger): What's the story behind the song "Untitled"? Graham: Especially in college, I (Graham) think that we are all tempted by the notion that God has given us a singular occupational purpose that provides utter fulfillment. As such, "Untitled" is a reaction to the tendency of Christians to assume they have a particular self-fulfilling place in this world before focusing on engaging in a lifestyle of open-handed trust in God. The story in the song is sort of a metaphorical parody of this. It just shows that the satisfaction of serving in God's kingdom isn't found in an occupation, a social cause, a mindset, or a dream; it's about living life and trusting God with the give and take, surrendering to Him because our only identity is in Christ. Simply put, "there's only One name that can be." JFH (Roger): What has surprised you about working as an independent band? Graham: We've been truly surprised at the many unexpected joys that come out of this adventure. Though it can be exhausting, it's been a very humanizing experience that's taken us many unique places as well as giving us opportunities to interact with all kinds of incredible people. It's been quite the wild ride, even just in 3 years. All in all, He is faithful, and the mystery of God using simple songs and simple people to minister to someone humbles us all the time. JFH (Roger): Tell me about the documentary your band released on YouTube? Graham: The best thing about college is the fantastic group of friends you meet. The second-best thing is having talented friends like Josh Hale (youtube.com/thebrotherhoodisdumb) who enjoy working with the things they're gifted in. This documentary was absolutely his effort, time, and accomplishment. He came to interview us when we we're free and slowly put the whole thing together. It's the perfect sort of things for super fans and our moms and dads, but it also reveals a surprising amount about our personalities, friendships, and life together on campus as a band. We were unexpectedly blessed with the opportunity to have this documentary made in anticipation of the release of In the Offing, and we think it's a great and honest look at us as a band. JFH (Roger): What are some overarching goals for Overseer in the near future? Graham: That seems to be the magic question for all of us college seniors, and we wish it had a magic answer! In truth, we've all stayed relatively open-handed about Overseer, each seeing God's leading in our lives begin to take shape in different ways. However, part of that for each of us has continued to be this band, and as long as we can we'll continue to play shows and events, write songs, and who knows? Maybe album number two is already, well, in the offing.